“Ubi Petrus Ibi Ecclesia,” “Where Peter is, there is the Church”, is the famous quote from St Ambrose of Milan. This statement makes an important claim; in fact, an undeniably outrageous claim. It points to the essential centrality of the papacy in relation to the Church’s unity. In other words, it is saying “without the papacy, there is no Church.” Though many would contest and reject the veracity of this claim, popular culture has accorded him a special role, a caricature at best. One such popular image is that St Peter stands as a sort of gatekeeper (“or perhaps, even a goal keeper), guarding the Pearly Gates, the entrance to the heavenly realm – a seemingly ignoble job. Though hardly accurate, the image is derived from the gospel passage we just heard today, where Jesus bestows special prerogatives on Peter. First, St Peter is given a new name, which in Scripture denotes a change in status or position. Jesus spoke Aramaic and gave Simon the Aramaic name Kepha (Rock) which is “Petra” in Greek and “Peter” in English. The Greek “petra” is feminine so the masculine “Petros” was adopted. If “Petra” refers to a rock, “petros” can refer to a little pebble. This has often been the contention of Protestants who see in the conferment of this name, not a great honour but a subtle insult. Protestants argue that Christ is the only foundation (1 Cor 3:11) attempting thereby to unseat Peter. There is, however, no distinction in Aramaic, between Kepha the “Rock” and Kepha, the Apostle Peter, upon which Jesus would build his Church. Peter is Kepha, He is the rock. In fact, Syriac Christians, who continue to use Aramaic in their scriptures and liturgy, also claim that Jesus, the Rock of Salvation, conferred his own name and title on Peter. This must simply be the greatest honour accorded to any man. Having been conferred a new title and name, St Peter is also given the metaphorical keys by Christ. As Jesus, the new King of Israel, re-established the Davidic throne he appointed Peter to the office of royal steward to rule “over the house” of the king. Keys represent primacy and exclusive dominion and this authority was granted to Peter alone. As the steward of Christ’s kingdom, Peter is given the authority to bind and loose. These are keys not of any earthly palace but of heaven itself, which is another way of saying that the issue is linked to salvation. Of course, this entails more than the no-brainer job of opening heaven’s door to the faithful. The term binding and loosing was also familiar in Rabbinic tradition. They represented the legislative and judicial powers of the Rabbinic office. These powers Christ now transferred in their reality here to Peter. 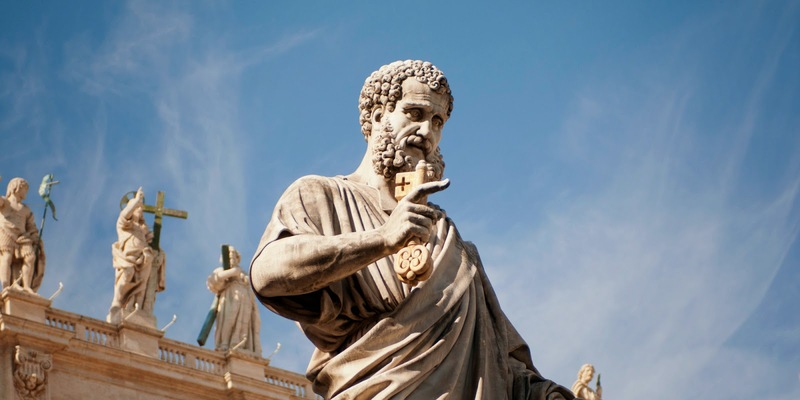 To say that St Peter has the key means he can declare certain things to be lawful and others unlawful; that is to bind or to loose, or to prohibit or to permit, or to forgive, and to teach and to govern with the authority of Christ in matters that are necessary for our salvation. In all this, he acts with the power of Christ! But the authority of the King, officially conferred here on his steward, does not end with the death of the steward. Jesus would not have missed filling up this gaping loophole. The office of a royal steward was a hereditary position. Familiar with their history, the Jews certainly understood that the office of Peter would be filled by successors as was the royal steward’s office in Judah. The steward may die, but the office continues. That is why the keys remain a prominent symbol in the coat of arms of every Pope. The authority and the power of the Petrine Office, that is the office of St Peter in Christ’s kingdom, which is now handed down to his successors, the popes, is not just a point of contention with the Protestants who clearly reject it, but has also become a scandal of sorts for Catholics. Irony has it that the rock, the foundation of our Church and our faith, has in fact become a stumbling block to critics, dissenters and persons who often treat their personal opinions as dogmas. For many people nowadays, there is something of a sense of skepticism about institutions – we tend to think of them as overly bureaucratic, slow to respond as if they were intentionally established to hold us back and slow us down. Our modern notion of democracy has also instilled in us a suspicion of arbitrary power, especially so much power centred on one single person. In fact, this expression has entered into the English language, “the Dread of Popery.” A belief popularly held by many is that no one individual should have unfettered powers of decision. Perhaps, the real point of contention is that no one should act like God, or at least act with divinely instituted powers. Ultimately, in rejecting the authority of Peter and that of the Popes, one inadvertently but necessarily rejects the testimony of Scripture and in doing so we reject the authority of Christ; because Peter is his choice. Of course, this link between rejecting the Chosen of God and the God who chooses is not confined to the papacy. Throughout Scriptures, we see God’s choices of leadership often been called into question because these do not conform to our own criteria of suitability for a candidate. In fact, God often chooses the least likely to succeed – the youngest or the oldest, the frailest, the most insignificant, the candidate most likely to fail. The choice of God often highlights his absolute sovereignty and gratuitousness, rather than a decision based on the extraordinary qualities of the candidate. The chosen man often has nothing to offer and can do nothing himself, but instead relies heavily on grace and the power of God. At the end of the day, God takes all the credit, not man. When God founded the Church, he founded a visible body, a visible body with a visible head, and that visible head had a name – Peter. The institution of the Papacy and the authority attached to this office is of divine institution. This was no human invention - the apostles did not come together and decide this. The Papacy and his authority was not the result of political manipulation. Quite the opposite, it is Our Lord who establishes this institution. It is Christ who builds and not Peter. It is not our choice, it is not our wisdom who picked out this apostle. The primacy of Peter is a primacy willed by God and not created by men. If you have any confusion in your mind where that Church is, when faced with all those conflicting voices that inevitably always sound sincere and credible, if there are different claims to the Truth, you can know with certainty where the church is, Jesus assures us, “I give you a marker, a beacon – look for Peter.” Peter will be a point of stability, a guarantee and an assurance that the Church will not be fazed even when everything shifts. In a market place filled with various ideological options, where the search for certainty and stability is often frustrated, the Papacy provides us with clear direction. Where do I find the fullness of the Lord? Where do I find His Mystical Body, and not just a body that I have constructed? Then we only need go back his words, “On this rock, I will build my church.” “Where Peter is there is the Church.” Of course, the Holy Father remains utterly human, he sins as you and I sin. He may have opinions as we do. But when he teaches in his office as Pope, we can have confidence that Christ speaks definitively through him. He is indeed a gift from God. I started with a quote from St Ambrose of Milan. Actually, the entire quote sounds like this, “Ubi Petrus ibi ecclesia, et ibi ecclesia vita eternal." Where Peter is there is the Church, and where there is the Church there is life eternal! If you want to know where the Church of Christ is, find Peter, and you will find the Church, and if you have found the Church and come to love Her and Her counsel and humbly submit yourself to the authority of Peter’s Successors, then be sure that you are on the sure path to eternal life.